DC’s recent decision to take a step back from the shared universe that gave us underwhelming films such as “Batman v Superman” and “Justice League” has been paying off with the recent success of “Aquaman” and this week’s release of “Shazam!”. 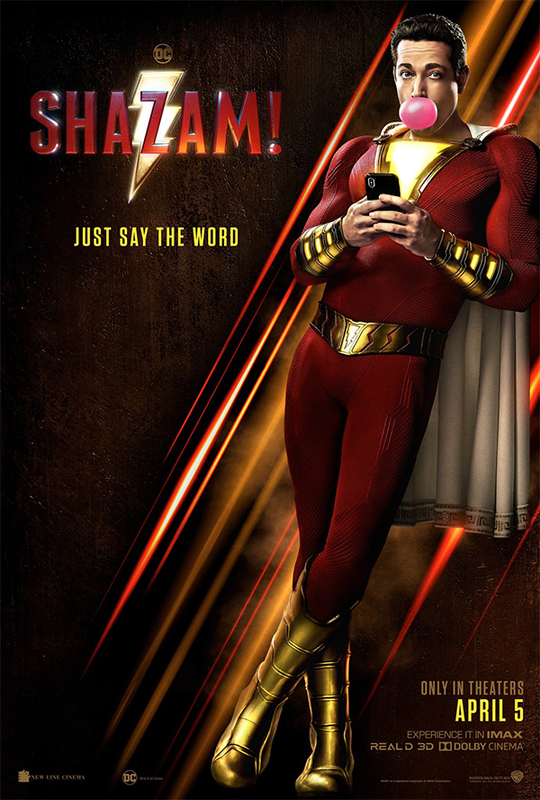 It is ironic that “Shazam!” is being released just a matter of weeks after “Captain Marvel”, since that was the character’s original name as well. What sets “Shazam!” apart from the previous DC films is that this one is a lot more comedic. “Aquaman” had its’ share of jokes, but “Shazam!” is the “BIG” of super hero movies. I have been a fan of Zachary Levi since his television series, “Chuck” and he has been perfectly cast at the fourteen-year-old boy in the body of an adult super hero. Levi has no trouble being a big kid. The story opens with a young boy being summed to the layer of Shazam (Djimon Hounsou) who is looking for a soul that is pure of heart to take his place. It turns out that this boy wasn’t pure and is sent right back from where he came. That boy grows up to be Dr. Thaddeus Sivana (Mark Strong) and he has spent his life trying to find his way back to Shazam’s lair. Once he succeeds, he claims an evil power that releases the imprisoned seven sins, which are creatures. Shazam does finally locate a worthy successor in Billy Batson (Asher Angel), a foster kid who has run away from every home he’s been placed in. Billy knows absolutely nothing about being a super hero, but his new foster brother Freddy Freeman (Jack Dylan Grazer) is an expert in comic books. He helps Billy figure out what his powers are and how to use them. Of course, being a teenager, Billy doesn’t use his powers for the most noble intensions. Shooting lighting into an ATM machine for cash to buy beer does not a hero make. Things change however when Billy is confronted by the evil and equally powerful Dr. Sivana, who wants to claim Billy’s powers for himself. When his foster family is threatened, Billy must step-up and become a real hero. Much like with “Aquaman”, “Shazam!” was directed by a filmmaker mostly associated with horror films. David F. Sandberg gave us “Lights Out” and “Annabelle: Creation”, films that were very light on comedy, but he clearly has a knack for it, as well as big budget comic book adaptations. He seems quite comfortable in this arena. What makes “Shazam!” work so well is the casting of not just the villain (Mark Strong is a great bad guy), but also Billy’s foster family. That is where much of the film’s heart lies. Grazer is a great deal of fun as Freddy but, young Faithe Herman who plays the youngest foster kid Darla is oh so adorable. I also loved that John Glover was cast as Thaddeus’s father. Those who are familiar with the television series “Smallville” will remember that he played Lex Luthor’s father, Lionel. “Shazam!” is the complete package when it comes to comic book films. It delivers on action, a memorable villain, a fun hero and it doesn’t take itself too seriously. It is simply a good time. I do hope DC continues this course. They didn’t need to try and copy Marvel, they just needed to make good stand-alone stories and they are finally doing it right. Advance Screening of SHAZAM! in Miami!